A practical guide to repelling indoor and outdoor pests using organic methods, updated with new information on getting rid of bedbugs and dust mites, plus includes updated online resources. This revised edition contains newly updated information on today’s pest epidemics, like bedbugs, as well as new online resources for finding beneficial organisms that act as predators for specific pests. 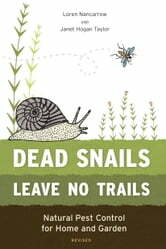 Full of tips, tricks, and straightforward instructions, Dead Snails Leave No Trails is the most user-friendly guide to indoor and outdoor natural pest solutions.